We provide a personal computer repair and support service for clients based within London. We specialise in looking after home users, small business users and corporate clients. Our repair services cover tablets, laptops, desktops and All In Ones and we repair to motherboard level and offer a No Fix No Fee Service. We also provide I.T. Support services for home and business users. Whether you have a single machine, or a peer to peer network or a Microsoft Server our engineers are Microsoft trained to look after your needs. Although Chiswick Computers (CC) is not an authorized Apple repair shop, it was Apple who originally mentioned their name as they had heard lots of positive reviews. Apple thought the power-board of our iMac might needed to be replaced as we could not switch on the computer. Steve (CC) explained exactly what we could expect from CC in terms of cost and timings. When starting the repair, CC noticed 1 LED wasn't working and proceeded to clean the inside of the iMac. As the iMac worked afterwards, they didn't do anything else and gave us 75 days warranty. Should the iMac be faulty within that period, we can return the iMac, CC will deduct what we paid for the cleaning and replace the graphics board. Excellent service. I have used Chiswick Computers for a number of years. Trustworthy advice, very reasonable prices. Available for me to call and ask for help. I would not use anyone else. I have been taking my computer to Chiswick Computers for about 20 years. My recent visit was just as good an experience as it has always been. I cannot recommend them highly enough - honest, reliable, hard working, caring and great to work with. Excellent service. Very professional and friendly reception. Machine is better now that ever before. I was very agreeably surprised by the bill which I found most reasonable. I will definitely come back and recommend Chiswick Computers to my friends… & keep it secret from those I don’t like. Coffee on my laptop. Nightmare. The manufacturer quoted £800+ but CC managed to repair it for £200. They kept me informed throughout the process. Highly recommended! Chiswick Computers copied all the data that I needed - my pictures and documents - from the failing hard drive of my old laptop on to my new machine. They really went the extra mile. 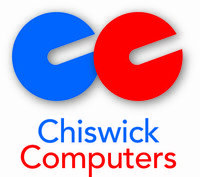 I had used Chiswick Computers before very satisfactorily. This occasion was similar. I was kept informed by phone and e-mail of how the job was progressing which I was grateful for as I had a deadline I needed it for. When it was ready to collect, Steve kindly said he would stay open later if I got delayed in collecting it. In fact, it wasn't necessary but I appreciated his helpfulness and the job was completed efficiently and very satisfactorily. This is the second time I've used Chiswick Computers, the first time in setting up a small company network over 10 years ago. It all worked fine and I never needed call them in again. 10 years later Steve made an appointment the same day and sorted out a glitch in a laptop and printer and gave lots of useful advice along the way. Not a giant op but good personal service. Excellent painstaking and efficient work whether obtaining spare parts or sorting out problems on my computer. Consistently patient courteous service .